What makes an itch? Certainly, when we’ll get one, most of us want to scratch it. One of my itches has always been throwing heavy slugs at moderate if not low velocities. I’ve been trying to find out why such an itch keeps bothering me. Memories about moments of joy when witnessing real bullets throwing plenty of dirt or considerable wood splinters may be enough. Add to that the invitation to cast my own bullets and keep costs at a minimum, and it had to happen. I fell for a new round and a fat number – five hundred. What finally led to the actual scratching was the low-cost launch platform. H&R chambers their Handi-Rifle in 500 S&W Magnum. Orders went out, and soon most ingredients were at hand to fire fat bullets. Talk about basic! The Handi represents one theme – simplicity. Break-open single shot with exposed hammer and open sights seems just a tiny step above muzzleloaders. Okay, the H&R does have a recoil pad, the open sights are enhanced with fiber optics (apparently no big deal anymore, even inexpensive air rifles have those now), and they drilled and tapped the thing for a scope mount. Just don’t look for luster blueing, perfect wood-to-steel (or pad) fit, or any sort of engraving. Even a blind anti-gun politician can tell the H&R apart from a Krieghoff. Folks, it is a tool, and with twenty two inches of barrel, indeed a handy one, just about the length of a basic Ruger 10-22. They left that barrel in the varmint fat outside diameter format. As it turned out, that is a very good thing when you unleash fat slugs which generate real recoil. 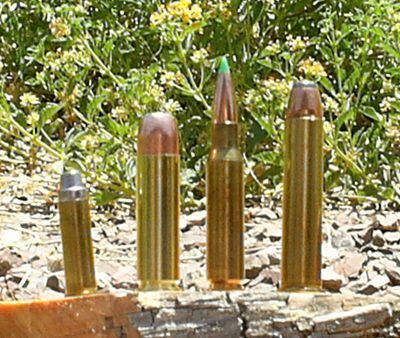 In comparison to a .223 Remington varmint barrel, the 500 is noticeably lighter with its big hole down the middle. Even so, looking at it and handling the gun reminds me of an elephant rifle, without being overweight - too cool! In contrast to the Handi you almost need sunglasses to inspect the cases from Hornady. Bright, shiny, and BIG. Yeah buddy, with a hole at one end of a true half of an inch. But nowhere near as long as a 45-70, for instance. To get a visual, check the picture where the 500 S&W is shown in mixed company with a 38 Special, 308 Win and 45-70. A few words from those famous campfire discussions may be in order. We’ve certainly heard that speed kills, hence all that magnum rage. The tunes from the old country, however, play along lines that a bullet needs to have mass. My own experience seems to confirm that. Where bullets completely penetrate game bodies, game certainly stops faster, if not drop right down. The 500, then, might offer enough of both worlds. Admittedly, I opted for the lightweight (?) projectiles initially, three-hundred grainers from Speer. What about load data? Hodgdon’s offers some, proclaiming that from a ten-inch barrel their “Lil’gun” propellant would make 325 grainer do over two thousand feet per second – that certainly more than pays for admission to be in the woods during elk season. What would happen after 22 inches of barrel? However, the main diet I wanted to feed this thing eventually was 440 grain lead slugs at modest velocities, more like 1150 fps. I would need to make those bullets myself. A first taste of the new rig came during our trap event in the spring, held in the desert. When it wasn’t my turn to try for clay targets I stepped away and launched two rounds out of the Handi, off hand. Corked with 300 grainers, recoil was stiff, but by no means unpleasant. The wind that day was, though. No further shooting took place. Pleasant was the fact that the factory sights seemed well adjusted. The very first Speer hit the target at about 40 paces. More tests would have to wait for another day. That came on a lazy summer Sunday, and after I had installed a 3-9 Sightron scope. The chrony also came along, to tell me how fast these fat bullets were flying. Early, really early Mike Stimens and I headed into hunt unit 19B. Game and Fish outdid themselves in their generosity and had mailed me a 2007 antelope tag. I wanted to make sure that the access roads to my favorite part in that country had remained open over the last five years. They had. That gave us some time for testing and just shooting for fun. To get right to it, the 500 S&W in that Handi package seems a little frightening. Recoil is not sharp or hurtful, but it does push you around. Noticeably. Mike declined to give it a try. We casually set up a target at around eighty paces. After a few trials, a 300 grainer eventually hit pretty much the center. Even better, the next one also landed right there, just about touching bullet holes, big holes that you can easily see through the scope. And shot number three sailed several inches high because yours truly flinched. In fact, it is neither easy nor much fun to shoot this rig with full power loads from the bench. The trigger tries to be fairly crisp, but is certainly on the heavy side. So you keep the crosshairs on target while ever more building pressure. Oh, you know when this thing goes off! Anyway, time to get away from the bench, and fire a few more rounds offhand. Did I mention the towel? Mike accused me of being a sissy by four-folding a towel to place between my shoulder and the recoil pad. I explained it was merely winter/hunting attire simulation. He didn’t buy it. Yes, with that towel where it needed to be, I fired a few rounds over the Chrony. The 300 grainers clocked 2200 fps, and the 325ers, 2130. For top speed, Lil-Gun seems to be the fuel of choice. Note that this level of power is not ‘above all’. You can get more from a 45-70. Except that the 500 starts out being a full half inch in diameter. And it does its tricks with less powder. I had also loaded a few 325s with H4227. They only (?) managed 2030 fps, so why bother with them? In order to empty the brass and maybe get an idea about terminal ballistics, one of them got directed at a branch of about four inches in diameter. Upon firing, two branches of that size came crashing down. Wow, the 500 had sheared them right off! Unfortunately we did not have the camera with us. To describe in words the effect this fat slug had on these branches loses something here. Seeing that in reality immediately gained respect. More testing followed, of course. I won’t go into the details here, wish we’d brought the camera. Anyway, the results left no doubt that the 500 S&W is oh-so destructive. Later I read on the web that that 325 grainer had taken down a cow elk, from a ten-inch hand gun barrel. The bullets reportedly had caused significant damage, forcing the cow to expire within ten staggering feet. I now have an extra hundred feet per second at my disposal. So I’ve all but decided that this Handi package will be on my shoulder during the December cow hunt (did I mention that G&F outdid themselves for me in 2007?). A little more shooting , need to get another box of brass and bullets, will tell if the Handi will out-charm my trusty 375 Mauser for this season. One thing’s for sure — it is the shortest CF rifle in my possession. And that makes it really handy in the woods. I’ll promise an update, including how this cast lead bullet idea will turn out.